For any start-up, one key to success is ramping up quickly. HA Advantage’s seasoned marketing group of two, while short on resources, is certainly not short on vision or ideas. HA Advantage knew that email marketing was going to be a large component of their marketing mix – but they were looking for a robust solution that would give them more, including the ability to immediately start generating inbound responses and leads for the sales team. Blogs, whitepapers, and social content are now a staple in the marketing diet. With the rise of content marketing, the rate at which content is produced and distributed has vastly increased, and your customers are bombarded with a virtual buffet of content and media on the daily. So what’s the secret sauce? How do you develop attention-grabbing content that will generate those allusive lead conversions? Join Janelle Johnson, Director of Demand Gen, and Linda West, Manager of Demand Gen to learn the recipe modern marketers use to hit the content sweet spot. Knowing your buyers’ behavior and the actions they take with your website and content is paramount to building an integrated marketing strategy. Failing to connect the dots on behavior between core channels will put your business at a loss. In this session the speakers will discuss how the new buyers’ journey requires a new engagement model, and will share the types of content and campaigns to implement to better brand and expand your business. Attendees will leave the session with an understanding of how to roll out an integrated marketing campaign that leverages offers/messages consistently across multiple channels. · How to create an integrated marketing blueprint that aligns marketing efforts across email, web, mobile and social. · How to nurture leads generated across multiple channels for each stage of the buying cycle. Learn how to lead in the dance between you and your customer and orchestrate success! "The bad buys use email and the good guys use email." Join Atri Chatterjee, CMO of Act-On Software as he discusses how marketers can responsibly use email to reach their prospect customers. Learn SEO strategies that companies of all sizes can use to increase site visibility, increase the number of visitors to their site, and most importantly – improve conversion rates. The rules change constantly; this webcast will bring you up to date on best practices for SEO in today's rapidly evolving world. Martin Laetsch is the Director of Online Marketing at Act-Software. Act-On Software is the world's fastest growing marketing automation company; its cloud-based marketing automation platform is the foundation of successful marketing campaigns everywhere – from small, simple and direct, to complex globally implemented programs. Martin is a marketing strategy leader with more than 15 years of experience with prominent companies guiding product management and marketing. While at Intel, Martin defined, built, and managed the world’s first enterprise-class search marketing program that became a standard for managing digital marketing programs for many of the Fortune 500 companies including Dell, IBM, HP, and P&G. How do you engage a person through the buying process?" Join Atri Chatterjee of Act-On Software as he discusses the value of nurturing prospect with content marketing, so that when it comes time to discuss a transation you have earned that buyer's trust. Lead Scoring is a under-used tool in the sales process. Only 18% of companies have marketing automation tools in place and even fewer are doing content marketing. Learn how the combination of marketing automation and content can generate Lead Scores that prioritize your sales efforts. Using disparate systems for email campaigns, online events, social media and web tracking only takes sales and marketing part of the way towards engaging prospects. Many progressive teams are realizing they need holistic tools and tactics to see the full picture on buyer behavior. Attend this Act-On session and learn how to identify key areas where sales and marketing teams are missing out on engagement opportunities with prospects by failing to connect the dots on behavior between core channels. Then, learn about some of the most fundamental steps to align your social and content strategies to tell the right story to potential buyers. The challenges for enterprise and SMB marketing automation are quite different. 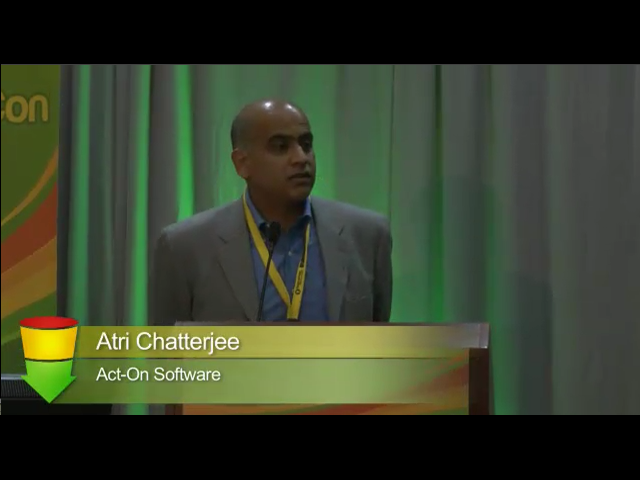 Join Atri Chatterjee, CMO at Act-On Software as he discusses how organizations of all sizes are using the same tools for quick success. This presentation will unpack the sales funnel by discussing some of the current sales challenges, understanding how leads get in the funnel, how they move to Marketing Qualified Leads and then to Sales Qualified Leads. The presentation will also cover a breakdown analysis of what constitutes the top, middle and bottom of the sales funnel and how to manage the prospect at each stage so you maximize your wins and minimize your losses. Martin Laetsch, Director of Online Marketing, Act-On Software, Inc.
Martin is considered to be a digital marketing strategy leader with more than 15 years of experience with prominent companies guiding product management and marketing. · Developing a responsive design, and so much more!!! In this webcast, we’ll uncover seven actionable, achievable habits that any SMB can use to drive revenue, based on research from Forrester Consulting. The seven habits range from outreach strategies to budgeting priorities that cover the lead lifecycle and beyond, with an emphasis on customer lifetime value. Webinars can generate healthy demand when sound strategy aligns with flawless execution. Join us for a live video roundtable with four seasoned marketers to learn their demand generation webinar strategies. Our panel has been asked to share how they create, distribute and measure their programs in 7 slides and 7 minutes. Infrastructure + Content + Humans = Revenue Success. Learn the key principals for sales and marketing success with a marketing automation “Blueprint”. We will discuss how to prioritize your content to match your lead management and scoring rules to ensure your sales reps have the right data to act on --without ever leaving the CRM. Learn the importance of a “marketing list” and what defines a “solid infrastructure”. All attendees will receive a free “Blueprint” and a content schedule that will insure their marketing success. Jeff Linton, Product Marketing Manager at Act-On, Mitch Emerson, co-founder of Compelligence, Inc. So much of marketing’s attention is focused on generating leads. But being prescriptive about the hand-off from marketing to sales – and ensuring your sales team is prepared to follow-up on those leads – is critical to ensuring the success of your marketing campaigns. Ensuring the sales team has the information it needs at its fingertips will enable them to see the whole picture -- and make the hand-off from marketing to sales as smooth as possible. Join Jeff Linton from Act-On Software and Mitch Emerson from Compelligence as they discuss what information marketing needs to provide to their sales team to enable targeted conversations with leads – and, ultimately, drive increased revenue. Speakers include Jeff Linton, Product Marketing Manager at Act-On Software and Mitch Emerson, co-founder of Compelligence, Inc.
Jeff is a speaker, presenter, and the 2006 winner of Selling Power Magazines “Sales Rep of the Year.” His 15-year career in B2B sales and marketing has been divided between roles as a senior sales executive and a marketing manager. Mitch Emerson is the co-founder of Compelligence, Inc. Compelligence provides a software solution that enables companies to compete more effectively by combining best practices with a set of tools designed to manage and distribute intelligence. Mitch has a vast background that includes technical, marketing, and corporate strategy. Not a day seems to go by without an announcement of a brand and a recent data compromise. Will yours be next? In this session, David Fowler, Chief Privacy & Deliverability Officer, Act-On Software will discuss ways to protect your brand, provide a “State of the State” of commercial email and provide information on tools you can use to protect your reputation. David is responsible for all issues pertaining to Email Deliverability and Privacy compliance pertaining to our clients and corporate objectives alike. David brings over 20 years of experience of senior leadership in the marketing industry including the last nine years strictly focused on the issues associated with email marketing, deliverability, digital marketing and privacy compliance. Prior to joining Act-On, David held US and European based Senior Management positions focused on Deliverability, Digital Privacy, Sales, Marketing, Business Development and Product Management with such companies as: Marketfish, Lyris Technologies, Blue Hornet / Digital River and Yesmail. David graduated from Marlyhurst College, Portland Oregon.